Hope I am doing this right. Got my squares cut out of blue jeans and flannel. I am using the Elmers glue method of gluing my squares together. Then I am going to sew them together row by row. Has anybody ever done this before? Wish me luck. This is my first quilt. Please give me some advise. I've made many rag quilts. I sew an X through the squares before sewing the rows. If I have to have a quilt by the next day I only sew an / through them. You need stitching through the squares to hold the batting in place. The rag quilt is very forgiving so don't worry too much about being exact. Buy rag snip scissors. If you only use them once they are worth the price. I prefer Heritage Spring Loaded scissors. 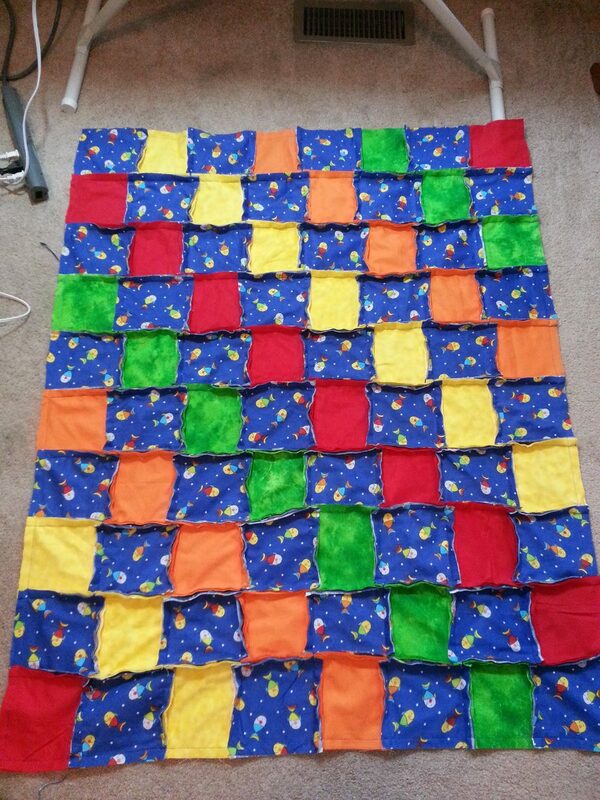 I can snip a King size rag quilt without stopping using them and my hand does not hurt. I have made so many rag quilts I bought two sizes of the Go rag dies. No snipping needed. My bigger scraps are always cut into rag squares. Rag quilts make great use and wash quilts. If you aren't using batting and only two layers then the glue is a good idea to keep them together as you sew. Make sure to set the glue with the iron before you start sewing. Otherwise it might gum up your needle. Because rag quilts are so forgiving, I save my glue for more exact quilting. I just sew squares together (first X then one to another) and move forward. I agree the scissors make ragging easier but I've done it without them. 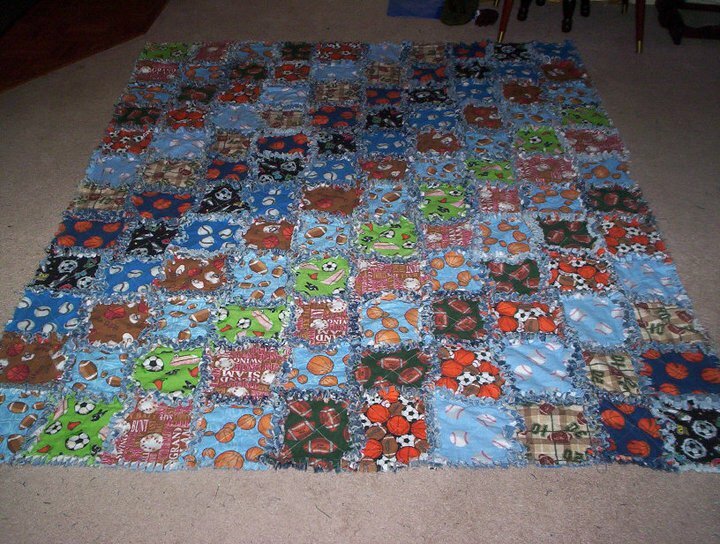 Rug quilts become addictive .... and are so much fun to make! Thanks for all your replies. I am not using a batting, just a single layer of material so I do not need to put an X. A single layer will be okay want it? I figure with jeans and flannel it should be warm enough. I have not heat pressed them yet. I guess when I get all the rows glued I will heat set it. I got some scissors and I think they will work. Any more suggestions, please reply. I am not fast with this so it will take me a while to make this quilt. I was on vacation this week and so I got a chance to start on it. Back to work next week. BellaBoo I have never made one, but don't you think she should x thru it? if under six inches square, I wouldn't bother stitching an X or otherwise. It should be fine. your flannel was washed first though, right? it does shrink a lot. 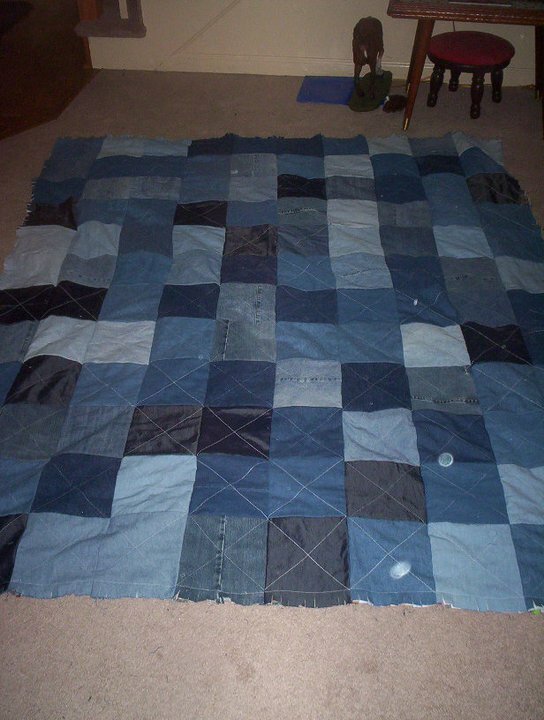 I made a denim/flannel one a few years ago for a pre-teen. I did not use any type of batting - just the two layers of fabric. I did sew the "X" on each set of squares. I kept the denim to one side and the flannel to the other. The seams were on the flannel side. I'm attaching some pics so you can see. I also just finished a flannel baby quilt. I did not sew "X"'s this time. I did not need to glue or baste my squares together. I don't think you would need to glue them, especially if you are not making an "X" on them. Just stack the 2 pairs and sew together like normal. I am sorry...I know a lot of you use Elmer's glue in your quilting but I really do not see the point. When I make rag quilts, I also sew an x through each block. In my opinion, you are wasting time gluing because I think the glue will wash out when you launder your quilt. Perhaps I am wrong, but I don't know that I would chance it. The glue does wash out. It is just a method of basting. Some people like to have their layers basted together before sewing the X through the squares. Some people pin. Some do nothing. It's a matter of what works for the individual.